Detox drinks, like most fad diets, often come with outrageous health claims attached. They promise not only to help you lose weight, but to rid your body of harmful toxins and fix all your health ailments. While detox drinks may help you lose weight, it's not because they contain some magical formula of liquids that helps your body melt fat, but more likely because they are so low in calories. Consult your doctor before adding a detox drink to your diet. Detox drink options range from teas to broths to plain water. 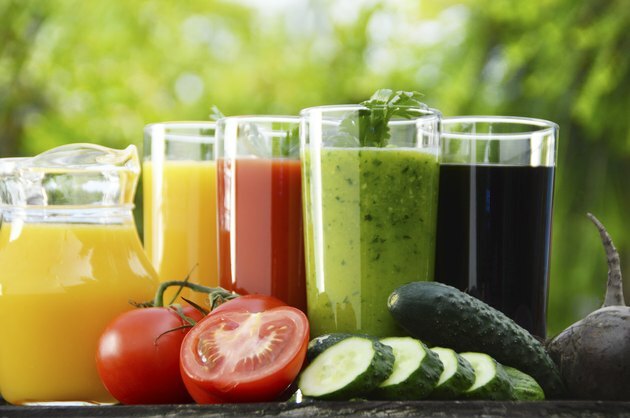 Raw fruit and vegetable juices are also recommended as a detox diet drink. A number of different drink concoctions are touted as being especially helpful for weight loss and detoxing. The lemonade diet, for example, consists of a beverage made with lemon juice, maple syrup, cayenne pepper and water that you drink for 10 days, along with salt water and a laxative tea. Most detox drinks include diets that limit your overall intake to a few foods such as fruits, vegetables, beans, nuts or seeds, along with herbal teas and a lot of water, says dietitian Juliette Kellow. These types of drinks and their diets help you lose weight by restricting your food and calorie intake, Kellow explains. The amount of weight you lose depends on the severity of the restriction. Diets with 800 calories or less are considered very low-calorie diets and should only be followed under the supervision of a doctor. Even if you're consuming over 800 calories, severe restriction can negatively affect your metabolism, making it harder to lose weight and keep it off in the future. Detox drinks for weight loss can be ineffective or dangerous, says a 2008 article published in Today's Dietitian. While the drink may help you lose weight quickly, you're most likely losing water and muscle and will probably gain most of the weight back. Detoxing without medical supervision may lead to electrolyte imbalance, which can be dangerous, warns Today's Dietitian. Detox drinks are not recommended for children, teens, pregnant women or people with chronic diseases such as heart or kidney disease. Additionally, there's no evidence that detox drinks can help rid your body of toxins or cure your health problems, says Kellow. If you're trying to lose weight and detox, a healthy diet that is calorie-controlled, low in fat and high in fiber is recommended. While most of the detox drinks, such as the teas, broths and the lemonade diet-like concoctions, are not necessary on your weight-loss diet; including fresh fruit and vegetable juices can help up your nutrient intake. To keep your juice calories under control, include mostly veggies in your juices.